‘OM’ is one of the most sacred Mantras in existence. It represents the Primodial God. When repeated, this mantra connects us directly to Parabrahma and His energies. A lot has been written and understood about this sacred syllable. Our scriptures say that Lord Brahma, in the course of His creation, created a huge empty space — the Material cosmos. Then at different points in this space, He created the sound Om and from these points, huge Galaxies emerged. And it’s the humming vibration of Om which gives the dynamism and movement to the Galaxies of our Universe. In fact, any movement, from the highest galactic level to the revolution of electrons around the nucleus inside an atom is powered by the vibrations of OM. ‘OM’ is also the root for many other words, many other mantras. The attributes of God — Omnipresent, Omniscient and Omnipotent are derived from Om. All mantras originate from Om. A mantra like ‘Om Namah Shivaya’, literally means, ‘O Lord Shiva, who has come out of the Supreme God (OM), make me Egoless (namaha)’. When the Rishis perceived the knowledge about the Unmanifested Universes and the Greater Light, Mula Brahman, some new information about the unknown aspects of OM was also revealed. In this article, let us try to understand more about these hitherto unknown attributes of OM. Where did ‘OM’ emanate from? Rishis say that this divine word and power, ‘OM’ was created by the primordial God, Mula Brahman Himself! When Mula Brahman came into existence, He wanted everything that he manifested and created to be united, to always be one with each other. Among His various initial creations, Sound had also manifested and after a lot of experimentation, Mula Brahman perceived that his entire creation could be One through the vibration of Sound. 1. It should be of a single syllable so that it can make the whole creation ‘One’. It should be simple and un-complicated. 2. He also wanted this Sound to represent Him and using this Sound, anybody should be able to connect to him easily. After a lot of experimentation, he felt very satisfied and impressed with the vibrations of the syllable ‘OM’. And as soon as OM took birth, it provided beautiful additions to HIS creation. When God created OM, there was no creation or layers, no galaxies or dimensions. When Om manifested, it created innumerable radiant particles, which were humming with the vibrations of ‘Om’. These are the Om particles and they constitute more than three-fourths of Mula Brahman. Many of these particles later came down as the Unmanifested Universes. A Mantra is a combination of sounds which, when repeated, connects us to an energy field and helps us derive energies from that field. 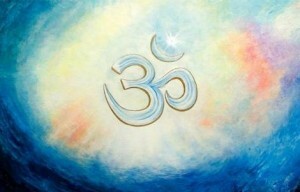 Rishis say that OM is the most divine and sacred word in God’s creation. They say that this word connects us to our Source God, ParaBrahma directly. When Om is pronounced (with a deep breath, repeat a long ascending OOOOO followed by a descending humming mmmmmm…) the first part ‘O’ symbolises God’s manifestation. There is a long phase of creation and then a withdrawal. The initial part of the pronunciation represents this creation and withdrawal of God’s manifestation. The ‘mmm’ in the end represents the manifestation that has taken place between creation and withdrawal. In Sanskrit, Om is represented by the symbol ॐ. There is a detailed explanation to what this represents but briefly – the two curves of ‘3’ signifies that everybody is equal. Also, it represents manifestation/withdrawal of Creation and also the birth/mukti of the Soul. The second part of the symbol which has the 2 curves and the dot – the lower curve represents surrender – complete surrender to God. The upper curve represents our Soul and the dot represents God. So this expresses that when we surrender completely, our Soul is connected to God. Among the Om particles, there was one very bright particle which did not want to become a Universe. That particle wanted to explore creation and serve God. Mula Brahman was very surprised by the love and affection of this bright particle and granted its wish. This particle gathered more Light and it became brighter and brighter and when manifestation happened, this Soul took birth and continues to serve God. This master is Vasishtha Maharshi. Rishis say that so far only a few masters have been able to access the energies of ‘Om’ particles. Through the grace of God, the Rishis have the technique to access these energies. They are waiting for the Light Age to fully set in and the individuals to qualify, so that they can pass on these rare energies to humanity. ‘Om’ can be repeated aloud, in whispers or silently. The silent repetition is most effective in stilling our minds and connecting us to the source, God. As we repeat, if we can feel the humming vibrations of this syllable in every cell of our body, we can easily sense the serenity and peace it carries. And when we are aware that this sacred syllable also represents the Unity of God’s manifestation, the repetition helps us experience the oneness that is inherently present everywhere. In the next part of the series we mention the names of all the Unmanifest Universes in our Heirarchy. Read more to understand the importance of having this knowledge. Thank you so much for giving such wonderful information to us. This really helps us to grow and expand. We are eagerly waiting for the golden age to dawn soon. you have explained about OM in short and explained very effectively its meaning and added a new knowledge about vasishta maharishi. keep up the good work you are doing. This article is really great and full of new knowledge. I have read books like Yogavasishta, Ramayana, Mahabharata, and Puranas. But no where this type of detailed information is given about OM. Thank you for giving us this wonderful information. A lot of the original knowledge was lost when we had to go through the dark age. The knowledge in the scriptures was the little that survived. Also, Rishis keep understanding more and pass on the knowledge to Humanity. Hence the new insights. Very informative and thought provoking article. You have explained the beauty and energy of OM so greatly. The information hidden in OM is precious to all of us. Thanks a lot , for providing such beautiful explination and bifercation of OM. Splendid peace of knowledge. Many many thanks for sharing such a deep insight of this word OM which however seems a very simple word, but in reality has a vast meaning. I wonder what inspired to write such a lovely series of articles. Once again thank you for all the important informations you are providing us and enlightening us. the article shares great insights. thank you! Is this possible for ordinary people ? Your advise please. Why do you feel that you were not connected to Parabrahma? The energies you receive, are from Him. What we suggest is to practice the same, with the awareness that you get connected to Him. Also while repeating, try to experience this vibration in your entire system. To help you further, try to experience that your entire system is filled with Golden Light, while repeating the mantra. This will help you much more. I will practice. thanks again! Again many revelations and many confirmations! It was wonderful to know more about the syllable I have loved the most, from ever. Again, knowing about Maharishi Vashistha was euphoric! Words are few to thank you for spreading such rare knowledge! Beautifully explained about the many aspects of OM and the Special Master. I feel so happy to know about these rare and sacred information! !